I seldom read translated books because something always seems to be lost in the translation. 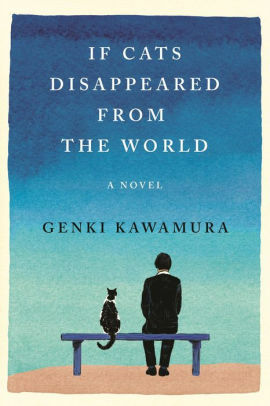 I don't think that happened with Genki Kawamura's If Cats Disappeared from the World. Eric Selland seems to have brought all the magic and thoughtfulness that made this book an international bestseller. It's a small book that might bring a tear or two, but it's one that will make you think. At thirty, the narrator, a postman, is told he has a brain tumor, Stage 4, and has very little time to live. His mother has been dead for four years. He hasn't spoken to his father since then. He lives alone with just his cat, Cabbage. He doesn't know how he'll spend his last days. Then, the devil shows up in his apartment. First, the devil challenges him to make that list of ten things he wants to do before he dies, and it's a pathetic list. In looking at it, it's easy to see the postman is looking for love. But, the devil has an alternative plan, a bargain. "Remove one thing from the world, and in return, you'll get one more day of life." It's an interesting proposition. What would you remove from the world? The narrator picks one item, and then, the next day, a second one. It felt as if they were selfish actions at first. He never even thought about how the disappearance of those items would affect people he knew. "When it comes to actually erasing things from your life, it actually makes you start to think." And, that's precisely what this story does; it makes the reader, and the postman think about life. What's important in life? What's important to the world? As I said, the book may bring a tear or two, but those tears are for the man who appears to have made a wise decision for the end of his life. If Cats Disappeared from the World succeeds as a thoughtful piece of writing, and, as a translation. If Cats Disappeared from the World by Genki Kawamura. Flatiron Books, 2019. ISBN 9781250294050 (hardcover), 168p. The title grabbed me immediately - since I just went through a period of 1 1/2 years with no cats for me a world with no cats is unthinkable. Cats are such wonderful creatures. I highly recommend to everyone if you want a loyal companion get a cat! I am going to look for this book and I know it will bring tears. You're going to like the cat, Donna. I promise. This was a moving book, but I don't think the ending will disappoint you.